Paper Size 5.5" x 5" to 9" x 16"
The highly adaptable 7102 Series Inserters create professional, high-quality mail pieces in minutes, saving both time and money. It is a very heavy duty machine with a duty cycle of up to 150,000 per month, 180,000 with the XT model. It is the toughest machine we carry. The modular design supports a wide range of mailing applications, accommodates a large variety of envelope sizes and processes forms with top, middle and bottom address positions. With 3 standard and 3 high-production configurations, this system can meet the challenge. The 7102 series can be configured with up to 9 feeders (17 for the XT,) 6 of which would be insert only for coupons, etc. The 7102 Series ability to handle mailing packets up to 1/4" thickness lends itself to a variety of applications including marketing collateral, invoices, monthly statements, booklets and more. This flexibility accommodates virtually all of your company's mailing needs. The space-saving design and ease of operation combined with heavy duty construction and durability make these inserters ideal for both the office and mailroom environment. The 7102 series can process different envelope sizes. These machines normally use a #10 standard commercial envelope with rounded-corner flaps that form a V shape. 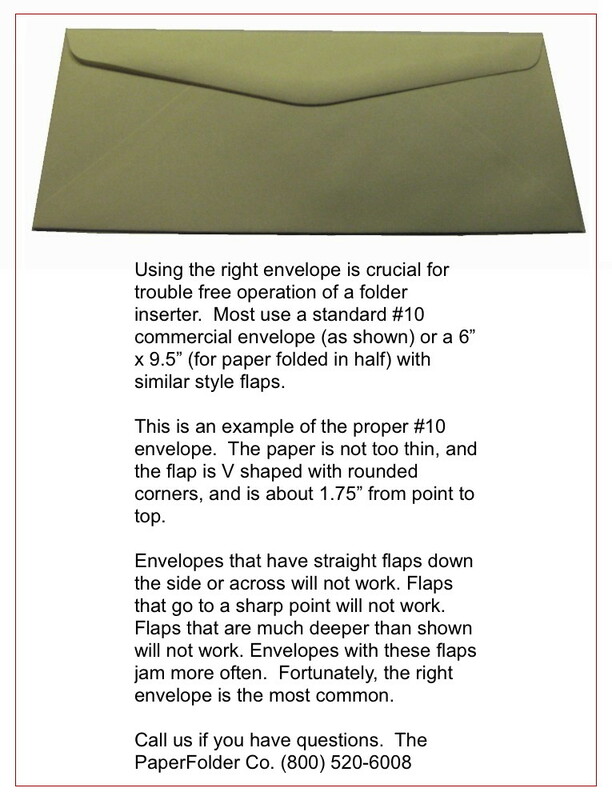 Envelopes with other kinds of flaps will not work. If you need to change the envelope, we can recommend a low-cost supplier. When you place an order for a FD7102, we want to make sure that your jobs and the stock you use can be handled by the machine. We discuss your process in detail, make any necessary recommendations, and have you send samples of your jobs to the manufacturer. They are tested upon receipt. When approved, Formax will send you a written guarantee that the tested materials work in the machine. Upon payment, the FD7102 folder / inserter is sent from the factory. It normally arrives within 10-15 business days. It comes with a 90 day on-site warranty, which includes setup and training by a technician from your local area. If you have a problem during the warranty period, your local technician must be on-site within 24 hours of your call. All parts and labor are covered. You can also purchase an annual on-site maintenance agreement that works the same way. All non-consumable parts and labor are covered, and two (2) general maintenance visits per year are included. The annual cost of the agreement starts at $4,695 for the base model, the 7102-Standard 1F. If you have been in business for at least 2 years, you have the option of leasing the machine for a period of 2 to 5 years. Fair Market Value and Dollar Buyout leases are available, meaning you can buy the machine at the end of the lease for its fair market value or for $1 respectively. Approval can usually be done very quickly, normally over the phone. Please call for a quote. Prices start at $46,995. Click on the brochure for more detail. We specialize in folder inserters (envelope stuffing machines), folding machines, paper cutters and other machines that process paper in your office. There are many machines of differing quality and capabilities. As experts with long experience, we can help you pick the right one. Please call (800) 520-6008. The goal of the PaperFolder Co. is to provide you with the folder, inserter, cutter or other machine that meets your needs.